Knee osteotomy is a surgical procedure in which the upper shinbone (tibia) or lower thighbone (femur) is cut and realigned. It is usually performed in arthritic conditions affecting only one side of your knee and the aim is to take pressure off the damaged area and shift it to the other side of your knee with healthy cartilage. During the surgery, Dr. Patel will remove or add a wedge of bone either below or above the knee joint depending on the site of arthritic damage. 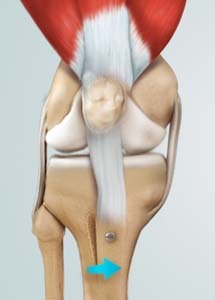 A high tibial osteotomy is the most common type of osteotomy performed on arthritic knees. After general anesthesia is administered, Dr. Patel will map out the exact size of the bone wedge to be removed, using an X-ray, CT scan, or 3D computer modelling. A four-to five-inch cut is made down in front of the knee, starting below the kneecap and running below the top of the shinbone. Guide wires are drilled from the lateral side to the top of the shin bone. A conventional oscillating saw is run along the guide wires and the bone wedge underneath the outside of the knee, below the healthy cartilage is removed. The cartilage covering the top of the outside of the shinbone is left intact. Then the top of the shinbone is reduced and fastened with surgical staples or screws. After the procedure is completed, the surgical site is then sutured usually with absorbable sutures and closed in layers.